Salvatore Battaglia and his wife Carolyn Stubbin are known for creating one of Australia’s favourite and most innovative aromatherapy stores, Perfect Potion. I’ve been using their products for decades, ever since discovering their store in Sydney, where I grew up. 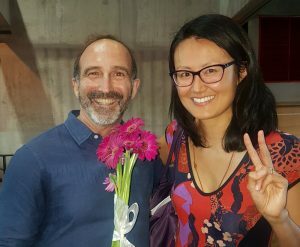 I met Salvatore at his workshop on Chakra Healing Through Aromatherapy at the Festival of Tibet in Brisbane recently. In the weeks before I booked, clients kept bringing me essential oils or talking about aromatherapy, so I took the hint and ended up booking into this talk. The numerology system I use is based on chakras, so I really enjoyed Salvatore’s passion for energy medicine. Here’s a picture of us – I gave him some flowers for letting me check out his hands and numbers! He even gave my baby Charlie a hug – what a legend. It seems fitting to post about him on Star Wars Day (May the 4th be with you), as Salvatore is definitely a Spiritual Warrior and a Starseed…see more on Star Wars numerology. Salvatore’s feedback on this post was, “I had tingle(s) down my spine as I read what you wrote. It has really reaffirmed quite a few things that have happened in my life and the path I am on. Please let me know when you post this and send me a link to it so I can then share with all our Perfect Potion customers…thank you so much for your palmistry and numerology reading – it has left me feeling really weird – ( I just cannot find the right word – I mean this in an incredibly subtle and nice way that is!!! )” So happy to hear he enjoyed the info below, his words made my week! 1) He has Composite Whorl fingerprints (the Starseed marking) on both thumbs, which I equate with psychic ability and objectivity. 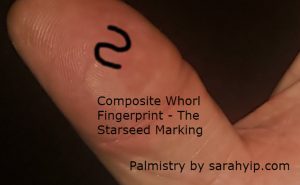 Both my partner and I have this feature, as do many of my friends, which is interesting as other palmreaders have said that Composite Whorls aren’t too common. I guess it’s a case of like attracting like. I see Whorls on the Apollo fingers as a discerning eye – someone who can spot flaws easily and has a distinctive style…they can feel a bit like a lonely visionary at times, so it’s important for them to express their dreams and seek out a like-hearted tribe. Otherwise they are at risk of ‘dying with the music still in them’. It’s always great to see these markings together, as they show someone who can switch modes. The Loop of Humour (which I also have in both hands), suggests an optimist, who can help people see light at the end of the tunnel. Many people with Loops of Humour have their own businesses or multiple sources of income (so they can take holidays or work/ retire when they want to), are good in a crisis and value people over money. I particularly noticed this in Salvatore’s business model, as he talks a lot about his staff and the environment. 5) He has a low-set Mercury/ Pinky finger (see how it starts around 1cm lower than his Apollo/ Ring finger?). This is common in healers, and can show shyness as a child and a preference for writing over impromptu talking. Many authors also have this feature, it often reflects a compassion for the voiceless and a tendency to keep feelings inside. I journal and see counsellors/ life coaches for this reason, as I tend to get stuck for words when faced with highly charged situations and relationships. As you can see, Salvatore has an amazing mix of palmistry features, which he was both born with and has cultivated through free will. 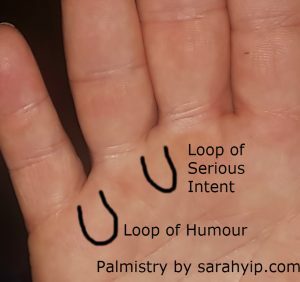 The lines on your hands can change over time, that’s why I like to combine palmistry with numerology in my psychic readings. I see palmistry as the journey you’ve made and numerology as the original map or trip you planned. Comparing where you are to where you want to be can be a deeply healing and energising experience! 1) He was born to balance the inner and outer Worlds. As a lifepath 26/8 (aka The Boss through Partnerships, or Spiritual Warrior) in numerology, Salvatore wanted to heal the 2nd (Sacral/ Divine Feminine), 6th (Third Eye/ Visionary) and 8th (Aura/ Karmic Patterns) chakras in this lifetime. Find your lifepath using your date of birth. Interestingly, there is no 8 in Salvatore’s name or DOB, so it’s possible in previous lifetimes he worked hard but did not experience the abundance, balance and recognition he desired – that’s a pattern he is here to break through in this incarnation. Our lifepath age is always a peak turning point. Around 26-28, Salvatore left engineering to pursue aromatherapy fulltime. That’s why I call him a fellow 11:11 flipper (he messaged me at 11:11am yesterday). Many people who see repeating numbers/ Angel Codes are here to build a bridge between cultures. For example, I was an environmental scientist before I turned psychic. There are seven physical chakras in the body, but once you get to the eighth, you’re leaping from the seen to the unseen realm (with training, you can ‘see’ auras, some people can also naturally do this). Salvatore is here to connect humanity with Spirit, and to heal ecosystems. No wonder words like FAITH, GOD, KARMA, THINK and ACTION have an 8 vibration in numerology – see the Pythagorean word analysis system I use. A healthy 8 lifepath can see both sides, shares generously and helps people to get moving (through a hand up, not a handout). An unbalanced or immature 8 lifepath is obsessed with perfection, can be pushy or impatient, and tries to stay in control. We can switch between these qualities throughout a lifetime (or during a day). That’s why numerology is great – it reminds us that everyone has gifts, but we’re here to use our ‘presence’ wisely. 2) His name suggests that he came here as a cosmic guardian. In numerology, all names, addresses and words can be reduced to a frequency (and chakra-related numbers). A 6 Destiny gives the bearer a desire to open minds (Third Eye Chakras) through their career. The number looks like a person who’s pregnant or has a ‘food baby’ and tends to suggest an interest in food, the good life and a love of watching things and people grow. Within a week of starting work in 1983, as an engineer in Tasmania, on the Franklin River, Tasmania (a 6 vibration state), Salvatore witnessed the birth of the Franklin Dam controversy. I’m sure this was Divinely planned. Salvatore couldn’t believe that people wanted to destroy such a beautiful place. I’m guessing this is one reason he got into aromatherapy, so that people could understand that plants are the original inhabitants of Earth and have so much to teach us. For the numerology nerds – Salvatore wrote and published The Complete Guide to Aromatherapy in 1995, his 5 or 6 Personal Year in numerology (see next point). This is totally in tune with his 6 Destiny. 3) He’s in a wonderful portal for positive change. Based on his birthday (kept private), Sal is in either a 1 or 11/2 Personal Year in numerology (some numerologists start the year on 1 January, whereas I use the birthday). This is the start of a new 9 year cycle (find your personal year forecast) and a total rebirth/ fresh start. Based on internet research, Salvatore and Perfect Potion always experience radical shifts in his Personal 1 Years, e.g. -In 1991, he launched the first Perfect Potion store in Brisbane with his wife, Carolyn Stubbin. -In 2000, they opened a TGA licensed manufacturing premises. -In 2009, Salvatore started boxing, after his doctor warned him about diabetes. This was after starting a Japanese branch in 2008. Depending on his choices, Sal can reclaim his childhood innocence and find more of his spiritual family over the coming months and years. His later life is ruled by Master 11 (the Spiritual Messenger), so he’s setting up his legacy from here onwards. As a Master 11 lifepath, I know this journey well – it’s about finding your independence (the first 1) then inspiring others to rise up (the second 1 in 11). It’s a huge adventure, and one that requires plenty of snack breaks and teamwork. No kidding, GO WITH THE FLOW also has a 72/9 vibration (see point 3) in Salvatore’s palmistry. I just realised this after checking my numerology database due to a Spirit Guide prompt. So, not only is Perfect Potion a living example of ‘Love Potion No. 9’, it’s also the best medicine for Salvatore…truly, a Divine alignment. ESSENTIAL OIL adds to 50/5, the same as INTUITION, so it particularly heals the 5th, or Throat Chakra, which is about finding alternative ways to succeed and building a bridge between your mind and body. I call 5 the Spiritual Rebel number, as it’s all about the freedom to experiment, blend logic and imagination and find your personal truth. I’ll have to do another blog on essential oils in future! OIL adds to 18/9 in numerology, the same as love – isn’t that amazing? More on healing your throat and inner voice. Thank you, Salvatore Battaglia from Perfect Potion for the chance to look into your palmistry and numerology. I always say to my numerology students, ‘with a lifepath 8 behind you, you can’t lose, with a lifepath 8 in front of you, you can’t win’. Salvatore is a great example of an 8 using his abilities to co-create, educate and circulate in an ethical way. I’m glad to have met him and his hands! Hopefully I’ll get to meet Carolyn as well someday. Thank you to everyone reading this post for your support and encouragement – it is truly appreciated. Palmistry FAQs – Which Hand Do I Read? Does My Lifeline Predict My Lifespan? All articles on this blog are copyrighted. Content may not be reproduced without written permission from the author. 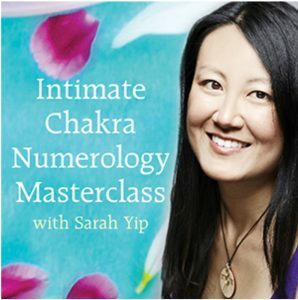 “NEW Masterclass with renowned numerologist Sarah Yip! Have you ever had that feeling when you meet someone for the first time and it feels as if you have known them for your entire lifetime? I had that feeling when I first met Sarah who had attended my Chakra Healing Workshop at the Festival of Tibet. Sarah Yip is well known for her psychic readings using numerology and palmistry. Sarah offered to do my palm reading and numerology. Now, I did not tell Sarah on the day that she was the first person ever to do my reading! When Sarah sent her reading back to me, I was left speechless. It honestly felt like she had reached deep into my chest, pulled out my heart – prodded and probed it, reaching deep down into my soul, and then ever so gently placed it back in the right place, leaving behind some of her magic! I had agreed to let Sarah post her reading on her website. She has been more than happy for me to share the link to the blog (below). It has helped me understand and reaffirm my life journey thus far and why Perfect Potion is such an important part of my life journey and means so much to me. I am ever so excited to announce that Sarah has agreed to do a workshop at our Banyo head office 27th June and will make an appearance at our 2018 Green Goddess Festival which we will have on Saturday, 20 October! Please lock this extra special day into your diary AND lock in Sarah’s very special masterclass event being held on 27th June 2018 at our Brisbane head office! Places are EXTREMELY limited so book now to avoid missing out on this incredible opportunity!